How are you getting on with your festive crafting? Are you nearly finished or just starting? In case you need a little more inspiration to get you through, Julia is here to show us how she’s using our latest range of 3D Embossing Folder’s to make a simple but effective Christmas card! Take your Versamark/WOW embossing ink and pat onto the emboss inside of the folder. Make sure you get plenty on. Place your Sheena Stamping Card into your embossing folder and run through your Gemini Die Cutting Machine using the sandwich of:- cutting plate, folder and card, magnetic shim then plastic shim. 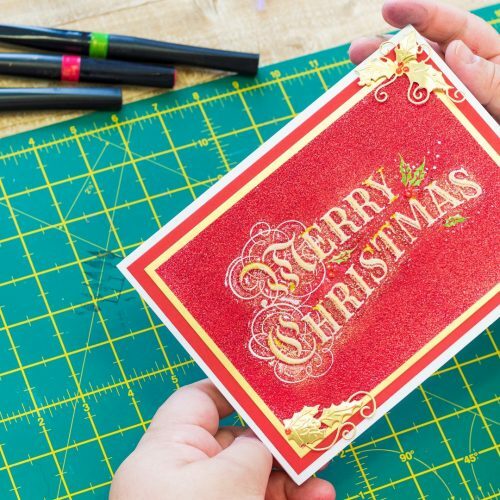 Remove the card from your folder and with a piece of scrap paper over your work surface, pour your red glitter embossing powder onto the sticky side of your card. Heat the embossing powder with your heat tool until set then, use your red sparkle pen to fill in any ‘missing’ pieces. Using a small amount of gilding wax, rub your finger gently over the words to highlight. Then buff with some kitchen paper. Colour your holly leaves with the green sparkle pen and fill any little bits of the writing with the gold sparkle pen. Mat and layer onto your card and add gems for the holly berries. 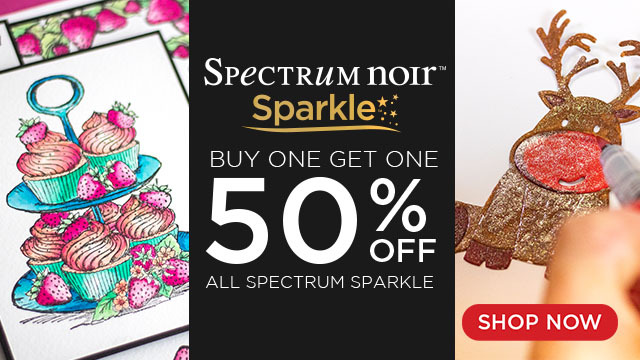 Why not stock up on Spectrum Noir Sparkle, now with this amazing deal, and shop the range of on-trend, seasonal colours that are perfect for colouring, writing, embellishing, accenting and more!